I was tromping through the garden in leisurely pursuit of my cat this morning, when I spotted what had to be one of the largest spiderwebs I’ve ever seen. It spanned all the way from a tree trunk, at about the height of my head, down to a bush at about knee-height. Normally, I’m not a fan of either spiders or spiderwebs and take to them with extreme prejudice. Charlotte’s Web did nothing for me in that regard, and I always believed that until the day I meet a talking, logophilic spider, nothing was going to change. But I’d woken up this morning to three incredibly itchy mosquito bites, with another one or two on my feet, and at that moment, my hatred of all things small, winged and buzzing outweighed my spider prejudice. No small feat, that. So I stopped and moved in not for the kill, but for a closer look in the hopes that I’d see a few hapless mosquitos struggling in the web. 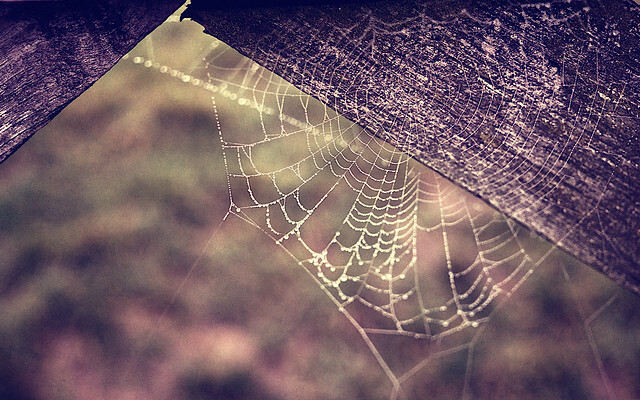 As I shifted position, the web caught the sun’s rays differently, and I caught my breath. The threads were a faint shimmer in the gentle morning sun, almost ethereal. Even the spider perched in the centre of the web was a delicate-looking thing, slim and tapered like the idealised glass slipper waiting for the right fit. I’d never stopped my vendetta long enough to consider just how frail a web seems when it’s blowing in the wind, how it seems like one strong gust should be enough to leave the whole thing in tatters. Yet the wind gusted, the web bounced, and nothing happened. Even the anchors seemed impossibly fickle. Aside from the tree trunk, the web’s anchors were a fluttering leaf on a branch, a lightweight flower petal. But they bore their duty with admirable restraint, hardly shifting as the wind tugged at the strings in a bid for control. The knowledge that spider silk is one of the strongest materials around is sheer theory, gauzy and flimsy, until you see it for yourself. I can’t say how long I stared at the web, watching it sway with the wind but never snap. The precise engineering of the foundation lines, suspending the web just so across a stretch of nothingness. The mesmerizing concentric pattern of the snare lines. And, I noted with satisfaction, the insect neatly wrapped up in a corner of the web, a fine early Christmas present if there ever was one. I stared at it so long that my cat actually came to fetch me, twining about my feet as is the wont of cats in general, and meowing for my attention. I regretfully turned away from the web and back to the realities of searching out the spot where my cat had done his serious business so I could play treasure hunter in the dirt. I can’t get the image of the web out of my mind, even now. I think I’ll seek it out again tomorrow; seek out that surprising glimpse of beauty and strength where I was once convinced there was none. Photo by Dan Cook, via Flickr.